Micah Degerlund, 17, has been handling dogs for Ray Redington, Jr. for the last six years and has competed in both the 2004 and 2005 Jr. Iditarod. 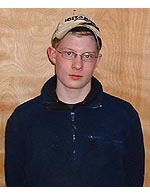 He’s in the 11th grade at UAF and says he enjoys shooting and hunting. Micah is not sure what he’ll do after graduation but he’s sure he wants to continue mushing.